Two Hydro Instruments chlorinator/sulfonators feeding a switchover unit which is connected to multiple remote meter-ejector pairs (called a feed-point). 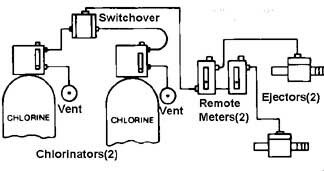 When the current supply tank empties, the switchover unit automatically switches supply to the chlorinator/sulfonator connected to the full tank. Each feed-point operates independently and the maximum rate of gas at any given time drawn by all the feed-points cannot exceed the connected chlorinator/sulfonator capacity.